This make ahead, and crowd-pleasing side dish is another gem in a Thanksgiving spread. Or any gathering, really. 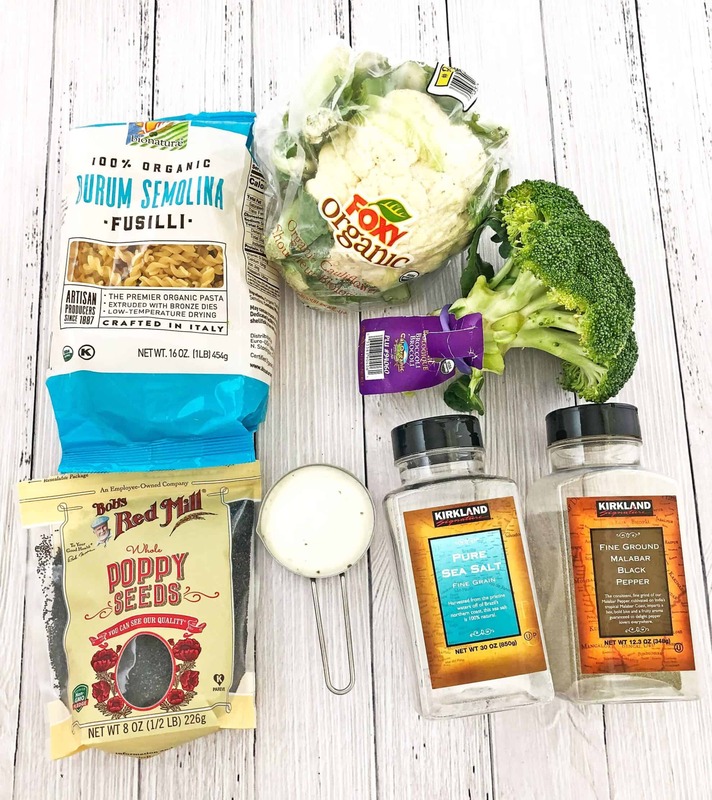 Organic pasta tossed with fresh broccoli, cauliflower, roasted butternut squash and dressed with homemade ranch makes this salad taste absolutely incredible! 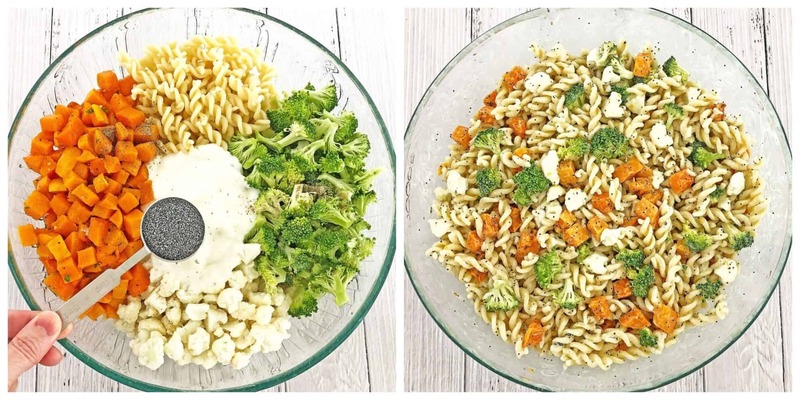 There is so much variety when it comes to pasta salads. 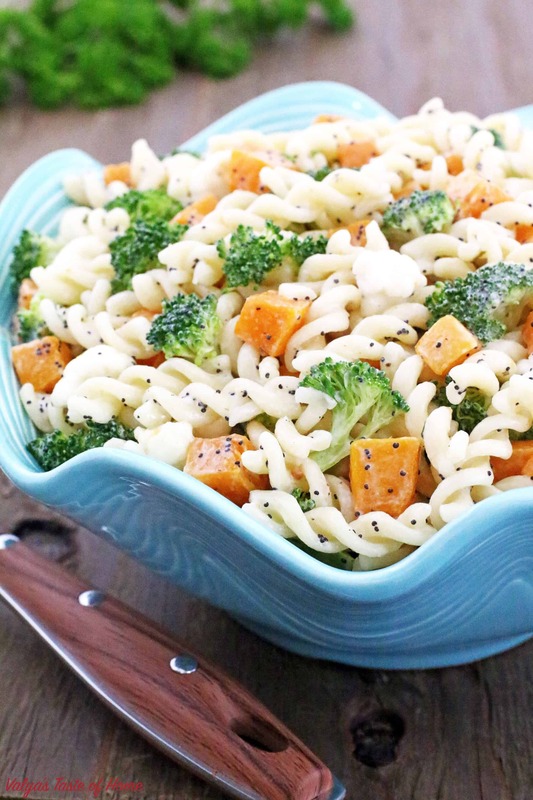 You can never go wrong with a hearty pasta salad because it is loved by almost everyone. And variations are endless. 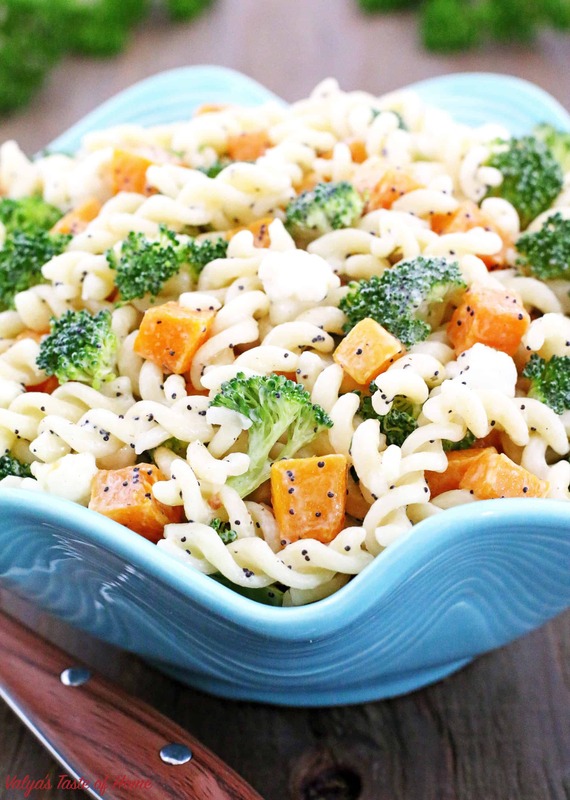 Add any other ingredients you love to a bowl of pasta and it will surely taste great. I usually enjoy salads with homemade oven toasted bread, but not with this salad. That would be a double duty on your tummy. 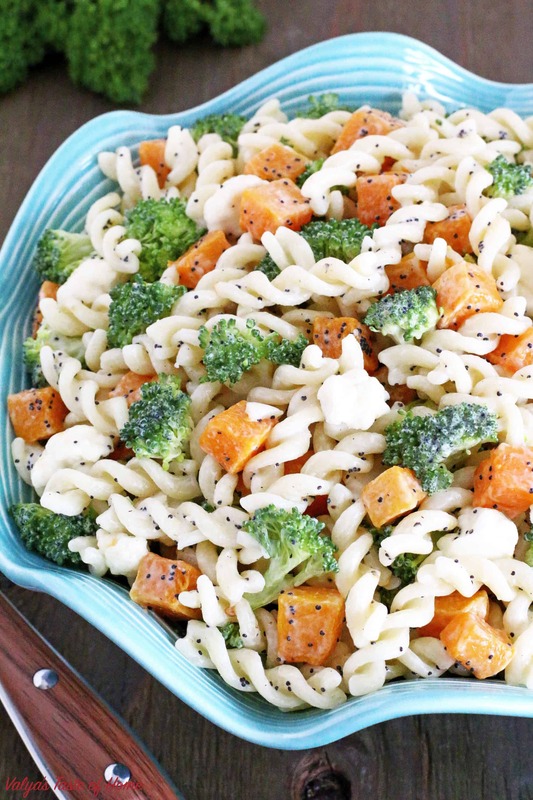 This carby pasta salad substitutes the bread and is very filling on its own. Give it a try! I used Homemade Ranch Dressing. Also, you can add cranberries and any toasted nuts of your choice (my kids don’t like any of it so I did not include in the recipe). 1. Roast Butternut Squash and cool completely before adding to salad. See how to roast Butternut Squash in THIS post. 2. While butternut squash is cooling cook pasta according to instructions on the package. Let the pasta cool. In the meanwhile, rinse and cut broccoli and cauliflower into small pieces. Place all the ingredients into a large glass bowl. Add mayonnaise, sea salt, and ground pepper. 3. Finally, add poppy seeds and mix everything well very carefully not to mash roasted butternut squash (add more salt and pepper if necessary to your taste). Serve and enjoy! The salad tastes great for a couple of days if kept refrigerated. 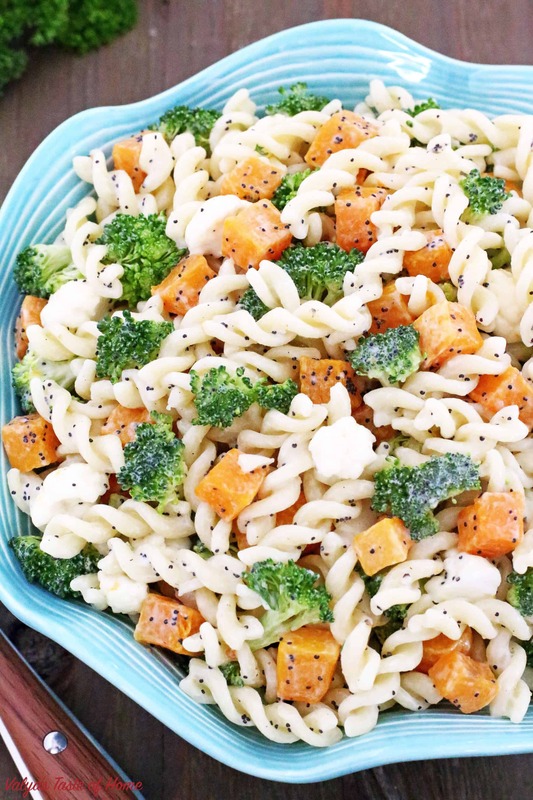 If you make this Butternut Squash Pasta Salad Recipe please share a picture with me on Facebook, Instagram or Pinterest. Tag with #valyastasteofhome. I’d love to see your creations! ???? Roast Butternut Squash and cool completely before adding to salad. 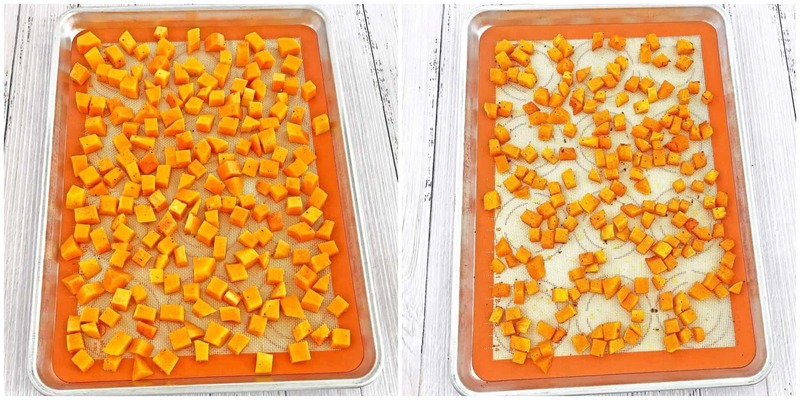 See how to roast Butternut Squash in THIS post. While butternut squash is cooling cook pasta according to instructions on the package. Let the pasta cool. In the meanwhile, rinse and cut broccoli and cauliflower into small pieces. Place all the ingredients into a large glass bowl. Add mayonnaise, sea salt, and ground pepper. Finally, add poppy seeds and mix everything well very carefully not to mash roasted butternut squash (add more salt and pepper if necessary to your taste). Serve and enjoy. The salad tastes great for a couple of days if kept refrigerated. Also, check out SALAD category for many more delicious salad recipes.